Arthur Posnansky was the illustrious pioneer of Tiwanaku archaeology, remembered as a quixotic, flamboyant, and swashbuckling character. He was a naval officer, a businessman, and a scholar. He dedicated nearly fifty years of his life to the study of the Andean past, which resonates through the history of Bolivian archaeology. While clearly not the field’s father, his commanding presence and outsized legacy could make him the czar of Tiwanaku archaeology. He developed a hyperbolic narrative of Tiwanaku as the ’cradle of American man’ and tirelessly promoted it in Europe and the Americas. Like many pioneers, he was not trained as an archaeologist. His theories were based on little concrete information but he defended them with enviable passion. His ideas were strongly influenced by intellectual trends he lived though and participated in, including racist anthropology. This has led some to dismiss him as a misguided, self-appointed champion of Tiwanaku. However, I suggest that Posnansky’s life and times are very relevant to both understanding popular views and scholarly interpretations of the site. 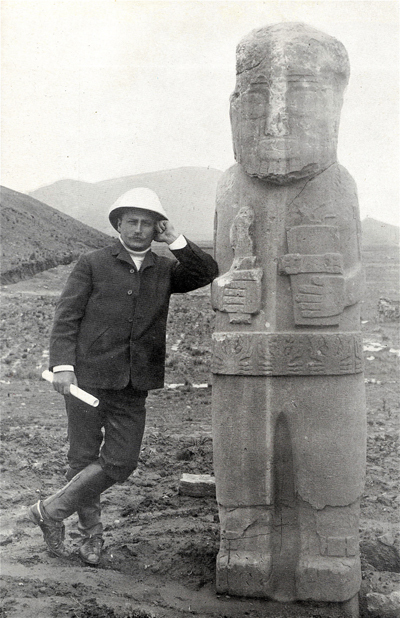 Arthur Posnansky was an illustrious pioneer of archaeology who spent most of his life defending and interpreting Bolivia’s past (Figures 1 and 2). His lack of methods, abrasive personality, and outlandish ideas make it tempting to dismiss him in the storied history of Tiwanaku archaeology. After his death, pseudo-archaeology appropriated his unfounded theories. He can also be questioned on ethical grounds: he was an advocate for racist anthropology and allegedly bought and sold artifacts. However, it seems hasty to relegate this ‘quixotic’ figure to a footnote in Tiwanaku archaeology, as in one history (Kolata and Ponce Sanginés 2003: 29). His flaws do not dilute his decisive and enduring impact on the development of archaeology at Tiwanaku and beyond (Browman 2007; Morris 2004: 7–10; Stefanoni 2012). Posnansky in his La Paz studio in 1939 at age 66 (modified from the image in the Spanish Wikipedia biography, https://es.wikipedia.org/wiki/Arthur_Posnansky#/media/File:Arthurposn.jpg). Posnansky’s signature from a hand-written book dedication in 1915 (modified from Ponce Sanginés 1994: 33). Some early pioneers can be considered scholarly fathers of their fields, but in Bolivia, no one fills this role. Posnansky was a passionate and inspirational scholar with an outsized legacy, but could not be called the field’s ‘father.’ He was not an archaeologist, though he did excavate a few test pits and at times would imply he had a role in others’ fieldwork, notably in the destructive 1903 French expedition (Ponce Sanginés 1994: 29, 293). The only other candidate would be Carlos Ponce Sanginés, who is more correctly called the field’s godfather (Browman 2005). Instead of systematically researching the past, both scholars focused on crafting a message based on archaeology. Posnansky could be called the czar of Tiwanaku – a dogmatic twentieth-century strongman who effectively controlled ‘Tiwanancology,’ his own term for the field, for half a century. Posnansky remains controversial. ‘To many, [he] was a genius; generous, passionate, warm, and upright; to others he was unrefined and snooty, whose research was more opinion than verifiable fact … the Nazi archaeologist’ (Gracia 2014).1 These extreme visions have contributed to confusion about his life. He is usually included in lists of prominent people and encyclopedias (e.g. Parker 1922) and mentioned by archaeologists (e.g. Albarracín-Jordan 2007: 18–22; Janusek 2004: 62–63; Kolata 1993: 13–17; Stanish 2002: 171–173) but information is not consistent. The problem has been exacerbated by pseudo-archaeology websites based on Posnansky’s ideas. Many of these sites are of dubious veracity, proliferate with surprisingly low fidelity, and quickly devolve into factual farragoes. Sources disagree on even basic points, for example his nationality, variously mentioned to be Polish, Austrian, Bolivian, or German. This is understandable: his surname and family were Polish. He was born in Vienna when it belonged to the Austro-Hungarian Empire. He lived in Bolivia for most of his life, where he was nationalized as Arturo Posnansky. He grew up speaking German and married a German, Alicia Lippmann. He studied and lived in Germany, where his family owned chemical factories. Throughout his life he favored German and Austrian ideas, equipment, and researchers (Schávelzon 1996: 343–344). Posnansky has had two biographers with very different perspectives and sources. The first, Carlos Ponce Sanginés, was a prominent Bolivian politician who spent decades directing massive excavations at Tiwanaku (Browman 2005: 16). Like Posnansky, he spent his life passionately defending Tiwanaku and founded a government institution to this end (Ponce Sanginés 1978). He was highly critical of Posnansky, but in many ways, his life’s work was a direct response to Posnansky, professionally and perhaps personally (Stanish 2002: 171–175). The second biographer, Daniel Schávelzon, is an Argentine historian and archaeologist who offers a more objective view. His biography is less detailed but does include the most accurate bibliography of Posnansky’s myriad publications. While it seems they were both researching their biographies in the early 1990s, there is no indication that they were aware of each other’s research. Their accounts are complementary because Ponce Sanginés (1994) worked with primary sources and newspaper articles available in La Paz while Schávelzon (1993, 1996) worked from documents in Berlin. This paper aims to integrate information from both toward a more balanced view that takes advantage of the increasing online availability of older publications (the bibliography includes links to many of them). This biographical sketch is organized around major themes in Posnansky’s life, presented in rough chronological order (Table 1). The first part of this article discusses Posnansky’s family background, exploits as a young man, and his business dealings. I include some historical background where relevant in order to facilitate comparisons to his contemporaries. I then turn to his archaeological imagination and his ‘eternal theory,’ which has had a sustained impact on modern myths of Tiwanaku. He was a jack-of-all-trades who engaged in very diverse endeavors. I argue that Posnansky has a sustained relevance in both popular and academic visions of Tiwanaku. I hope this article clarifies some aspects of Posnansky’s life and brings it to a broader audience, in part by writing in English – most sources are in Spanish – and in an open-access journal. It may be useful in comparisons to other archaeological pioneers discussed in this journal, such as Schliemann and others (Ponce Sanginés 1994: 108–114), with whom there are many parallels. There is circumstantial evidence that Posnansky was from a Jewish family that emigrated from the Russian Pale to Vienna in the 1860s. His family was Polish (Parker 1922: 229; Schávelzon 1996: 336) and the surname has been common in Jewish communities for centuries. The surname implies an origin in the Poznán region, currently in central Poland. In the nineteenth century, the region included Polish, German, and Russian residents, who would have spelled the surname Posnanski, Posen, and Posnansky, respectively. The Russian spelling implies an origin in eastern Poznán, part of the Russian Pale, where archaeologist Merrick Posnansky’s family was from (2009: 14, 249). Despite sharing a surname, Merrick’s genealogical research did not uncover any relation to Arthur, though he has often been asked (personal communication, 2008). Many Jews left the Russian Pale following the 1861 Emancipation of the Serfs, especially well-to-do families who could more easily move to a new country; Arthur’s family was by no account poor (Ponce Sanginés 1994: 11). In 1867, Austria-Hungary’s new constitution granted Jews full citizenship, something very unusual amidst the period’s strong anti-Semitic currents (Cahnman 1989: 7). This helped drive a mass migration to Vienna and the city’s Jewish population mushroomed from 6000 to more than 146,000 between 1857 and 1900 (Rabinbach 1975: 43). These migrants may have included Arthur’s parents, Charles Posnansky and Rosalia Alexander. Arthur was born in Vienna in 1873, on 12 or 13 April – sources disagree (Costa de la Torre 1974a: 16; Ponce Sanginés 1994: 11; Schávelzon 1996: 338). Posnansky’s writing includes hints that he was influenced by a Jewish background. Following thinking in Germany and other countries, his opinions grew increasingly racist during the thirties, before reaching a climax in his book What Is Race?, published during World War II. He smoothly divided modern groups into superior and inferior races with a clear preference for Axis nations: the Germans and Japanese were superior while the Russians and Chinese were inferior. Unexpectedly, he criticized the Nazi’s political appropriation of anthropology and argued that neither the Aryans nor Jews were in fact races. He strongly defended the Jewish community, including Jewish migrants to Bolivia, as spiritually evolved and hardworking (Posnansky 1943: 7–9; see Quisbert 2004: 205–206). Two years later, he published his opus in New York (Ponce Sanginés 1994: 90). Even though most of the content was a re-publication of earlier work, there was a conspicuous absence of any racism or material from his more racist publications (Richard 2005: 199). Posnansky’s contradictions and change in tone might be explained as a reflection of world events (Quisbert 2004: 182–183), but perhaps a Jewish background also had an influence. His temporary move to the US reinforces this possibility. As Nazi glory was fading, Posnansky left Bolivia in 1944 for New York, where he stayed until the end of World War II (Ponce Sanginés 1994: 90; Schávelzon 1996: 349). This move may have been motivated by souring attitudes toward Jews in La Paz. The trend was clear as early as 1940, when a presidential declaration suspended entry of ‘Semitic elements’ into Bolivia (Estrada 1942: 42–43 cited in Quisbert 2004: 206). The tense situation built to a December 1943 coup led by Villarroel, then seen as pro-Axis and anti-Semitic, who was supported by officers with strong fascist leanings (Blasier 1972: 41–45). Villarroel’s government fell dramatically when revolutionaries killed him and hung his body from a lamppost in 1946, echoing Mussolini’s fate. Despite Posnansky’s high standing in the elite circles of La Paz, he may have considered the situation too unstable to remain in Bolivia or return to Germany. His Jewish surname might explain his choice to relocate to the United States, where he had never lived, instead of Germany, where he had lifelong personal and academic ties. While far from conclusive, there are clear hints he had a Jewish background, though he did not seem to acknowledge this in print. The life of Arthur’s father, Charles, foreshadowed his son’s life: both made sea voyages to the New World, sailed with the Austro-Hungarian navy, and owned factories. In the 1860s, Charles traveled to Mexico with Archduke Ferdinand Maximilian, the commander in chief of the Austro-Hungarian navy. The Archduke invaded Mexico in 1862 and became the Emperor of Mexico until his execution in 1867. Charles returned from Mexico and started a chemical laboratory in Vienna, part of a business that grew to include locations in Berlin and Cologne (Schávelzon 1996: 343). These seem to have stayed in the family, as Arthur mentioned decades later that he had to borrow money from his brother, who owned a chemical factory in Berlin (Ponce Sanginés 1994: 60). Some sectors of Vienna’s chemical industry increased output fortyfold between 1841 and 1873, with most of the growth after 1860 (Bowman 1999: 30), coincident with the large Jewish migration to the city. The chemical industry initially interested Arthur, but his father’s death led to a change of plans (Parker 1922: 229). Following his father’s footsteps, he began naval engineering studies at the Imperial Naval Academy in Pula (currently in Croatia), which had been Austria-Hungary’s principal military port since the 1850s. In 1895, Arthur graduated and became a lieutenant. He then acquired the 18-meter, Hamburg-built Anni (Ponce Sanginés 1994: 11), a ship he used to amass a fortune importing rubber from the southern Amazon. He embarked on extensive sea journeys between South America, Europe, and the United States. His father seems to have left an indelible business and naval imprint on Arthur’s education and later pursuits (Maldonado Leoni 2009). As a young man exporting rubber from the Amazon, Posnansky solidified his credentials as an adventurer, soldier, and trader during the rubber boom in the Amazon (Figure 3). His formidable vessel was larger than most in the area with 25 tons of cargo space (Ponce Sanginés 1994: 11; Schávelzon 1996: 338). In 1897, he began bringing rubber to the Brazilian port of Manaus from the Acre river region, which belonged to Bolivia (Fifer 1970). This lucrative trade became precarious when armed conflict broke out between Bolivia and Brazil in 1899. He renamed his boat Iris, offered it to the Bolivian cause, and it became the country’s first naval vessel (Figure 4). He was captured, nearly killed, fought local indigenous tribes, and ‘possibly lived out his youthful dream of adventures’ (Schávelzon 1996: 339). He then repaired his boat in Germany and returned to Bolivia. 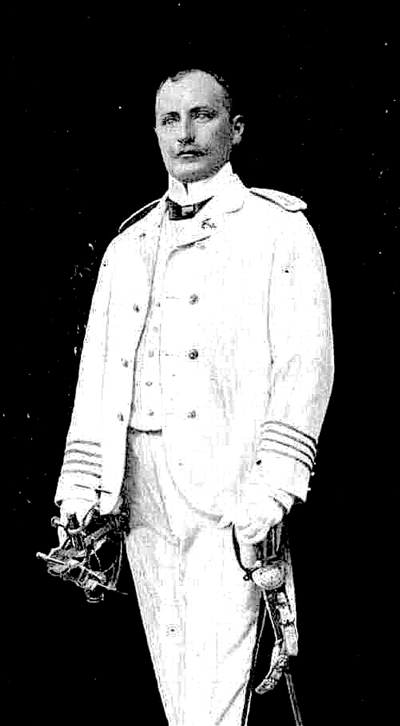 Posnansky as a young man in his naval dress uniform, from his book on his adventures in the Amazon (Posnansky 1904: Frontispiece). Schematic of the Iris (Posnansky 1904). He self-published The Acre Campaign in La Paz in 1904, which described his Amazonian adventures. It was written for the express purpose of winning the public to his side in a lawsuit against the Bolivian government. He was suing for compensation for his boat, which Bolivia had sold to Peru, and eventually won £11,000, a substantial sum at the time. In contrast to the heroic explorer that the book describes – perhaps Posnansky’s flattering vision of himself – Ponce Sanginés (1994: 12–20) cites eye-witness accounts that suggest Posnansky’s actions were self-serving. However, other accounts are more sympathetic (Báyron G. 1974; Maldonado Leoni 2009). Posnansky also published a river chart and an ethnography of the region (Schávelzon 1996: 338), making his first foray as an explorer and ethnographer, dovetailing with his roles as a soldier, captain, and businessman. Like his father, Arthur was a shrewd businessman. As soon as he moved to La Paz in 1903, he eased into high society’s political, commercial, and cultural cliques (Parker 1922: 232; Ponce Sanginés 1994: 28–29). His reason for traveling to La Paz in the first place was to seek compensation for his boat. This provided more than enough capital to begin a new life in the heights of the Andes, not to mention his wealth from rubber trading (Ponce Sanginés 1994: 19–20; Posnansky 1904). Shortly after arriving in La Paz, he proposed a German–Bolivian railway corporation to the Bolivian president. He asked for a loan and exclusive rights to the use and construction of railways in Bolivia, but the proposal was rejected (Ponce Sanginés 1994: 29). 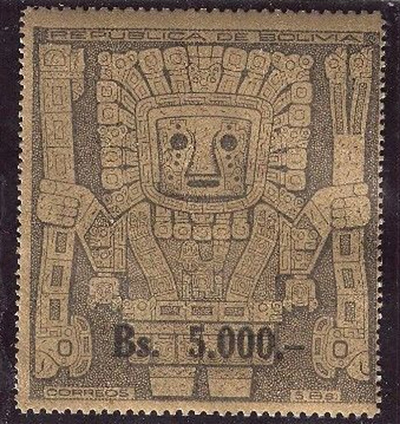 Posnansky’s most dubious entrepreneurial venture was the production of stamps with the design of Tiwanaku’s most famous sculpture, the Gateway of the Sun (Figure 5). The government accepted the proposal in the name of Carlos Arturo Posnansky (perhaps meant to be Arthur’s father or brother) to print the very large quantity of 15 million stamps (Ponce Sanginés 1994: 57–60). The contractor would earn a 3 percent commission, a considerable sum. Arthur was behind this, and undertook the characteristically elaborate and painstaking process of precisely reproducing the Gateway of the Sun on a stamp. A full-size plaster model of the monument was made and shipped to Berlin. Cutting-edge photogrammetry was used to record the precise designs on the gateway and reduced them to the size of a stamp. The designs were so intricate that they were nearly impossible to print. Scandal broke out a year later when only a few thousand stamps arrived and even fewer were put into circulation. Furthermore, it seems that Posnansky had been presenting himself as a Bolivian diplomat abroad and unfairly claimed the full commission of the proposed number of stamps. Posnansky responded to legitimate concerns about this episode with stories laced with the fantastic and bizarre, at least in the judgment of Ponce Sanginés (1994: 60). One of the Bolivian stamps Posnansky had produced, based on a life-size replica of the Gateway of the Sun and photogrammetry (http://www.ebay.ie/itm/BOLIVIA-GATE-OF-THE-SUN-MINT-SET-OF-18-STAMPS-CV-144-00-/142412771917). In 1914, Posnansky returned from a two-year stay in Germany to settle down in La Paz with his new wife and infant son. He built a house in the Miraflores district of La Paz. He bought the whole district with the intention of building a Tiwanaku city centered around the ‘American Man’ plaza (Gracia 2014). He also acquired a nearby factory that produced pottery, bricks, and roof tiles, which provided a comfortable family income (Ponce Sanginés 1994: 92, 94). The factory produced the best products in the city and was Posnansky’s most enduring and stable enterprise. 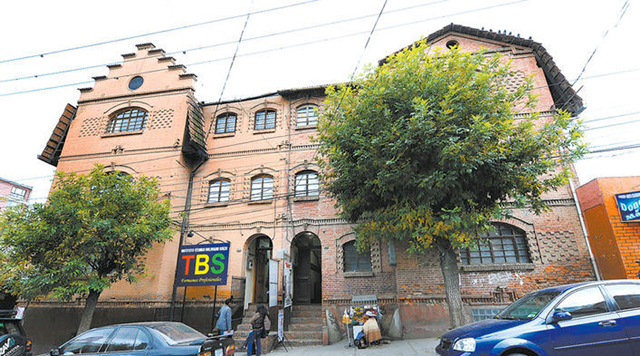 The house was buried in a sudden mudslide and with ‘admirable tenacity’ (Ponce Sanginés 1994: 93), he built a second house in the same style, called Posnansky’s palace, this time in downtown La Paz. Posnansky’s palace was built in a neo-Tiwanaku architectural style (Figure 6; Browman 2007: 30–31; Castillo 1918; Ponce Sanginés 1994: 44–45). This style was a notable part of an indigenist movement in the 1930s and 1940s that elevated Tiwanaku’s past in art, poetry, and music. Posnansky was an active participant and contributor to this trend (Browman 2007; Rossells 2004; Quisbert 2004; Sammells 2012; Stefanoni 2012). In 1922, Posnansky sold this building to the Bolivian government for what Ponce Sanginés (1994: 43–49) calls a disproportionate profit. Posnansky may have originally built it as a private museum for his personal collection of artifacts (Browman 2007: 43). When he sold it to the government, it became the National Archaeology Museum and he became its director. He probably had a government salary and acquired government funds for an extended research trip to Europe. Records of his tenure are characteristically missing (Ponce Sanginés 1994: 49). Preferential dealings with the government seems to have been bolstered by Posnansky’s friendships within Saavedra’s political party, which came to power in 1921, the year before the government bought his house. Many of the government’s decisions were carried out as presidential decrees, including the purchase of the museum and later adjustments to the means and amounts of payment. This building remains Bolivia’s largest and most important museum. Posnansky’s second house, a ‘palace’ built in neo-Tiwanaku style. 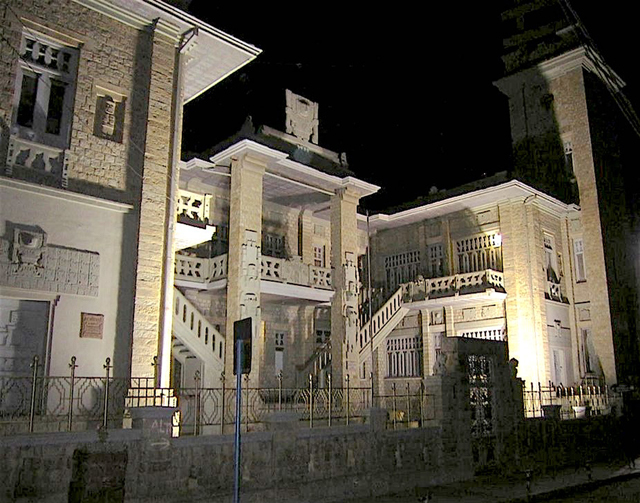 Since 1922 it has been the National Museum of the Archaeology of Bolivia. His third house was built near the stadium in the Miraflores district (Figure 7), where he lived from 1920 until his death in 1946. The three-story brick house is full of iconography and astronomical alignments inspired by Tiwanaku. He imported a tree from Germany, apparently to cull the favor of Tiwanaku’s gods, according to his great-grandchildren (Gracia 2014). This was meant to end the curse that had apparently caused the mud slide that buried his first house, drowned his three-year-old son Carlos in the fountain of his second house, and killed his son Raúl in a 1943 avalanche. He was survived by his wife and only one of four children, Manuel (Figure 8; Costa de la Torre 1974a: 22; Ponce Sanginés 1994: 92–94). The gods may have finally listened. Posnansky’s granddaughter, great-granddaughters, and great-great grandchildren still live at this house, which is nearly a century old (Figure 9; Gracia 2014). Posnansky’s third house in the Miraflores district of La Paz where his descendants still live (modified from Gracia 2014). 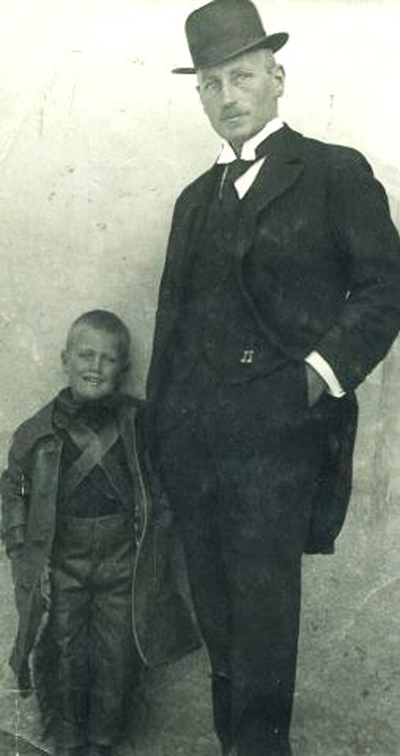 Posnansky with his son Manuel (photo from Posnansky’s great-granddaughter Vanessa, http://es.wikipedia.org/wiki/Arthur_Posnansky#/media/File:Arthur_Posnansky_3.jpg). 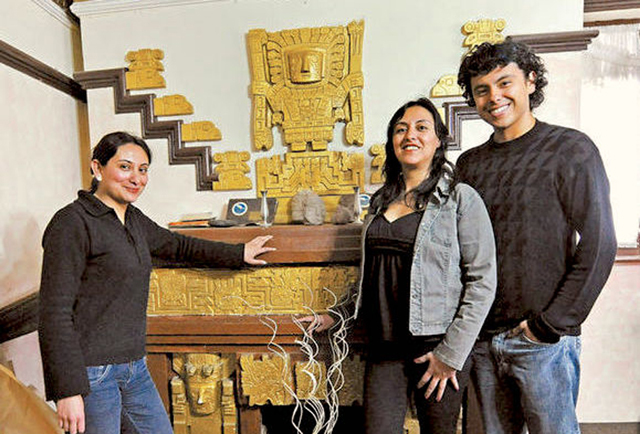 Posnansky’s great-grandchildren in front of the house’s Neo-Tiwanaku style fireplace (modified from Gracia 2014). Like many archaeologists, it seems that Posnansky’s passion blossomed from a vivid imagination. It was fired by experiences in his youth, such as a long sea voyage to the South Pacific that was part of his naval training (Parker 1922: 229). He was intrigued by the native cultures and ethnography of the region. His thesis, written when he 22 years old, proposed connections between the monuments of Easter Island and Tiwanaku, previewing his later theories (Schávelzon 1996: 338). Decades later, the adventurer Thor Heyerdahl (1958) and Von Däniken (1969) furthered this idea and brought it to a larger audience (Andersson 2010: 85). While far-fetched by today’s standards, there had been no systematic research at the time and such diffusionist explanations based on stylistic similarities were common (Stanish 2002: 172). The nineteenth century has many examples of colonial excursions to the Americas that combined scientific and military ventures. The imagination of Posnansky as a teenager may have been influenced by his father’s trip to Mexico. While he was there, Napoleon III formed a Scientific Commission in 1864, a conscious attempt to emulate Napoleon I’s lauded 1798 cultural and military invasion of Egypt (Edison 2003: 459; Williams 1993: 124–127). Both invasions sought museum collections from past civilizations (Ponce Sanginés 1969). French colonialism blended cultural, scientific, and military adventuring with the goal of expanding French hegemony. This model guided a modest but destructive French expedition in Tiwanaku in 1903 (Crequí-Montfort 1906; see Kolata and Ponce Sanginés 2003: 14; Havenon 2004: 336–342; Marsh 2005). The French crew was digging the day Posnansky first visited Tiwanaku, 16 November 1903 (Figures 10 and 11; Ponce Sanginés 1994: 27). 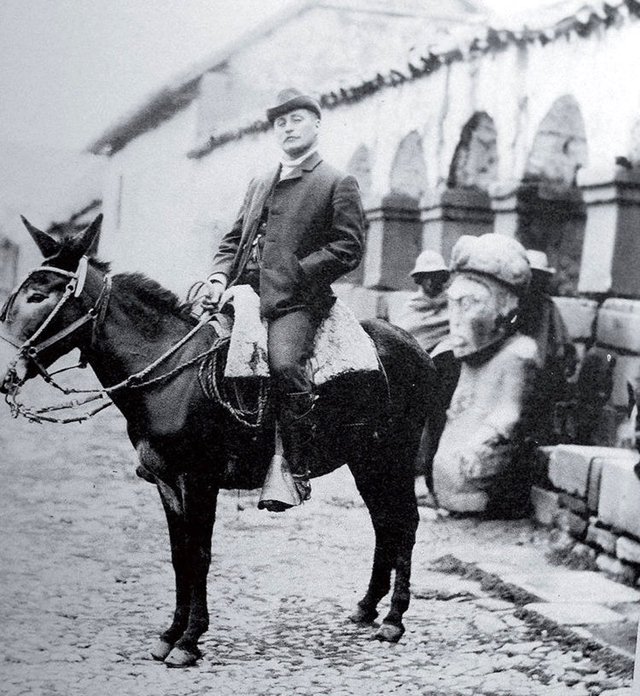 Posnansky in 1903 (30 years old), the year he visited Tiwanaku for the first time, leaning against a monolith known as El Fraile. He seems quite content and is dressed for the part (as he must have imagined archaeologists dress), complete with pith helmet, gaiters, handlebar moustache, and a roll of documents (Posnansky 1945, II: Fig. 108). Posnansky in front of the modern church in the town of Tiwanaku (modified from Gracia 2014). Even though the celebrated explorer Humboldt (1810) did not visit Tiwanaku, his mention of the site as the cradle of an ancient civilization inspired visions of past Andean glory. Following Humboldt’s landmark publication, there were a series of traveler’s reports of Tiwanaku and initial efforts at systematic research (e.g. Angrand 1866; d’Orbigny 1854; Inwards 1884; Squier 1877; Mitre 1879; Stübel and Uhle 1892). These publications were in circulation during Posnansky’s youth and must have been his source of information on Tiwanaku, which he had not visited when his wrote his thesis (Schávelzon 1996: 336). This period saw a surge of European expeditions to South America, spurred on by European audiences anxious for enticing tales of lost civilizations in exotic lands. Tiwanaku was one of America’s archaeology hotspots (Havenon 2004: 327–329; Kolata and Ponce Sanginés 2003: 19–23). This colonial era produced and was produced by spotlight-loving figures like Posnansky. They were explorers and gentlemen, scientists and voyagers, self-assured and well-to-do. They had the resources and drive to seek out knowledge of distant, exotic cultures, past and present. Many thought they could civilize indigenous cultures ‘through the retrieval and reconstruction’ of their more glorious pasts (Edison 2003: 159) and that they needed European help to do so. After an evolutionary epoch of the highest grade… the magnificent creators fell into an involution, attributable principally to climatic changes, racial struggles and the abuse of narcotics and fermented drinks, until they reached the unhappy state in which the conquistadors found them in the sixteenth century. Posnansky proposed a five-stage sequence that began over 12,000 years ago (the date varies and is as old as 17,000 years ago in some publications) when the altiplano was much closer to sea level and there was an ideal semitropical climate. With the level of Lake Titicaca some fifty meters higher it would have extended to Tiwanaku, which is currently about fifteen kilometers from the lakeshore. Tiwanaku was a port, the ideal setting for a magnificent city, a vision that seems to reflect Posnansky’s own experiences in cosmopolitan seaports. The Colla race, who originally occupied Tiwanaku, were later invaded by a more intelligent race, the Aruwak, who were responsible for the blossoming of high civilization (see Janusek 2004: 63). These scenarios were informed his own detailed work in Andean racial anthropology and ethnography (Posnansky 1934, 1937a), which Quisbert (2004: 204) suggests reflect little more than aspirations to revive a mysterious and lost glorious past in a modern, nationalistic context. From this primordial nexus of high culture, Posnansky (1945, I: 5) argued that populations and ideas diffused throughout the Americas. He followed the Argentine paleontologist Carlos Ameghino (1880) who suggested that humans had evolved independently in South America (see Kolata 1993: 15–16). He integrated this into his Tiwanaku narrative (see Browman 2007: 35; Schávelon 1996: 350) well after it had been discredited by the Czech anthropologist Aleš Hrdlička (1912). In the days before radiocarbon dating, astronomical measurements were among the few potential dating methods. Posnansky solicited the German government for help with this, which set up an observatory in La Paz in 1926–1928 (Browman 2007: 37; Duerbeck 2006: 398; Ponce Sanginés 1994: 138–140). Posnansky collaborated with Arnold Kohlschutter, Rolf Müller (1931), Friederich Becker, and Hans Bellamy (1936), who developed an interpretation of the Gateway of the Sun as a calendar (Bellamy and Allan 1956: 22). The decipherment of this monument’s iconography was a research focus for decades (Posnansky 1914, 1945, II; see Sammells 2012: 301). Posnansky used this calendar to organize political events at Tiwanaku on equinoxes and solstices, a trend that continues today (Browman 2007: 32; Kojan 2008: 69; Kojan and Dante 2005). The ideas were a timely part of the World Calendar Movement and its 1931 proposal to globally replace the Gregorian calendar. Not unsurprisingly, Posnansky suggested using Tiwanaku’s putative calendar (Sammells 2012: 309–314). Posnansky’s narrative of Tiwanaku’s history included two races, one inferior and one superior. The definition of the races was based on the craniometry of modern people and archaeological crania, an approach he learned in Berlin during post-graduate studies in physical anthropology. He studied with Felix von Luschan and Rudolf Virchow in 1912–1914, for which the Bavarian king apparently conferred him the honorary title of Professor (Parker 1922: 233; Ponce Sanginés 1994: 96). Posnansky followed the period’s dominant ideas on eugenics and physical anthropology, which sought to define human races, past and present. He presented his racial anthropology of Bolivia in his 1937 book, Anthropology and Sociology of Inter-Andean and Neighboring Races. This was a clear expression of scientifically-grounded racism that built to a climax in World War II (Quisbert 2004; see Siapkas 2016). His 1943 book What Is Race? presents nakedly fascist sympathies and supports radical political applications of racial anthropology. This brought sound critiques by prominent anthropologists, notably Juan Comas (1945), and for some, left a moral stain on his other contributions (Ponce Sanginés 1994: 120–129, 140–142; Schávelzon 1996: 350–351). He finished editing his magnum opus in 1944 and moved to New York to have it translated to English and printed, which he paid for himself (Ponce Sanginés 1994: 90). He stayed there until the end of World War II, when he returned to Bolivia and died of a sudden stroke on 27 July 1946 (Gracia 2014; Ponce Sanginés 1994: 105–107; Schávelzon 1996: 349). The opus was primarily a reprinting of previous work, yet his racist and political sentiments were conspicuously missing following the defeat of Nazi Germany (Richards 2005: 199). It should come as no surprise that Posnansky’s opinions swayed with the times, as the construction and dissemination of his narrative was highly political and lacked scientific rigor (Bennett 1948; Uhle 1912). Despite his narrative’s many flaws, it is a milestone in the centuries-old endeavor of myth making at Tiwanaku. Tiwanaku has an undeniable capacity to spark wonder and curiosity, and has done so for centuries. Even some Inca creation myths identify the site as the origin of the world (Julien 2000). European imaginations continued and expanded this tradition (Kolata 1993: 1–16). Posnansky’s version of the myth synthesized popular ideas among travelers and Americanists (e.g. Adams 1915; Ameghino 1880; Angrand 1867; Diaz Romero 1906; Inwards 1884; Mitre 1879; Robinson Wright 1907; Squier 1877; Villamil de Rada 1888). Posnansky disseminated this re-packaged set of ideas in an elegant fashion and was apt at finding science-based foundations for them, though he rarely cited others’ work, preferring the ideas to look original (Uhle 1912). He liberally borrowed concepts and phrases, including the subtitle of his opus, Tihuanacu: The Cradle of American Man (Gildner 2013; Schávelzon 1991, 1996: 340; Stanish 2002: 172). He added a good measure of credibility by associating with respected politicians and researchers as well as presenting in the hallowed halls of academic institutions in multiple languages. Posnansky’s chronology was discarded shortly after his death with the site’s first radiocarbon dates (Ponce Sanginés 1994: 140). Based on these dates, Ponce Sanginés proposed a much shorter chronology in an attempt to distance his purportedly scientific approach from Posnansky’s, but in fact there are significant parallels. Both chronologies use five-stage sequences of cultural development and are millennia older than current research suggests (Marsh 2012: 204–205). Like Posnansky, Ponce Sanginés did not change his narrative for decades, and was principally motivated by the political use of information about Tiwanaku to support Bolivian nationalism (Albarracín-Jordan 2007: 31–47; Janusek 2004: 64–66; Kojan 2008: 73; Oyuela-Caycedo 1994: 13–15). Neither were trained as archaeologists. Both were working on four-volume opuses on archaeology when they died (Browman 2005: 21). Both avoided criticism by keeping rivals out of Bolivia and eschewing international or peer-reviewed venues. Both had deep political connections and excavation permits were largely contingent on their blessing. Posnansky paid for the printing of his books instead of submitting them to a publisher for review; Ponce preferred government-funded institutions he controlled (Browman 2005: 20). Posnansky’s version of the Tiwanaku myth was effectively marketed outside academia, which is a central reason it endures. He seems to have been more than happy to provide tours of the site, often to prominent foreign visitors who later disseminated his ideas (e.g. Kiss 1937). Robinson Wright (1907: Chapter 15) published an early tourist’s perspective on Tiwanaku illustrated with Posnansky’s photographs. Much of the description is based on Posnansky’s ideas, including comparisons between the monoliths of Tiwanaku and Easter Island. This publication brought Tiwanaku to a much larger audience in the United States, just a few years after he arrived in La Paz. In 1910–1912, he published attractive illustrated guides to Tiwanaku and the Islands of the Sun and Moon (Posnansky 1912; see Ponce Sanginés 1994: 33, 180–181; Schávelzon 1996: 354–355). His narrative has continued to find fertile ground with pseudoscientific myth-makers such as Von Däniken (1969) and Hancock (1995), who rely heavily on Posnansky’s ideas and scholarly authority (see Derricourt 2012; Fagan 2006). Today, aspects of Posnansky’s fascinating and fantastic myth can still be heard on tours of Tiwanaku (Sammells 2012: 302). The modern myth of Tiwanaku has countless variants that share a central themes with Posnansky’s well-proselytized version (see Stanish 2002: 171–173 for a succinct summary). A site so fantastic seems to require fantastic explanations. The door to the rabbit hole is the conviction that the ancient setting must have been completely different from the modern one and that the modern Aymara inhabitants could not possibly have built great monuments. This inductive approach argues for a superlative antiquity of many thousands of years. This was supported by detailed astronomical observations from the Kalasasaya Temple (Müller 1931) and calendric interpretations of the carvings on the Gateway of the Sun (Bellamy 1936; Bellamy and Allen 1956). The site has also been dated by associations to events described in the Bible, Egyptian prehistory, and even Plato’s description of Atlantis (e.g. Allen 1998). All of this supports the intuitive idea that it must be very old, an essential assertion in the myth of Tiwanaku. In terms of the people involved, this ancient civilization must have been had advanced architecture and engineering, apparent from the large, elaborately-carved stone blocks on the surface. A society capable of building monuments would have to be organized into leaders and workers – two different human races or even species (Quisbert 2004: 197–198). This derives from the social construct that was part of the reigning world view, shared by La Paz’s high society and visitors who could afford the trip from Europe and the United States (Gildner 2013: 105; Kolata 1993: 16). To put it mildly, they had a low estimation of the local Aymara people and could not fathom that there was a connection between them and the leaders of a once-glorious Tiwanaku. Hence, another superior race must have evolved in South America or immigrated there many thousands of years ago, proposed to be Aryans from Northern Europe, Atlantis, or beings from another planet (see Stanish 2002: 172). Finally, the climate must have been very different many thousands of years ago because a great civilization could not have flourished on the barren altiplano, where there is little possibility for large-scale agriculture. It follows that Tiwanaku was close to sea level at some point, which means it was built during a different geological epoch. Ancient shorelines proved that many eons ago the Andes were much lower or sea levels were much higher (Posnansky 1914). World Ice Theory, popular until the 1930s, proposed a period of high waters that submerged most of the planet, sparing the highest mountains (Bowen 1993; Goodrick-Clarke 2002: 131–134; Hale 2003: 118–120; Pringle 2006: 179). This would make Tiwanaku a magnificent port, following Inwards’ (1884) well-illustrated imagination (Figure 12), an idea repeated for over a century by Posnansky (1914: 19), Kiss (1937: 21), and Hancock (1995: 71; see Richards 2005: 203). From the perspective of a well-to-do traveler in the colonial era of sea-based empires, a port city would be ideal for trade and conquest. The great civilization ended as waters receded, and the advanced builders of Tiwanaku spread their people, culture, and technology throughout the Americas. 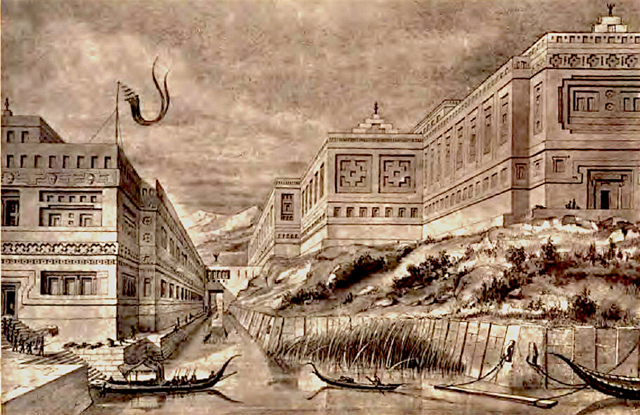 An early, speculative reconstruction of Tiwanaku as a port city (Inwards 1884: Plate 6). Variants of this myth have propagated for centuries. Posnansky made a singular contribution to legitimizing it, which still resonates with the general public. Tiwanaku is featured in websites, books, and television shows, which are usually much better known than archaeological research. Even more objective treatments of Tiwanaku are sometimes organized around testing fantastic possibilities (thankfully shown to be false in many cases), drawing audiences in with the undying mystique of ancient, advanced, and lost civilizations (Derricourt 2012; Fagan 2006). Like other pioneers, Posnansky had the advantage of being one of the first to make detailed proposals about Tiwanaku, so there was little prior research to contradict him. Over the years, he remained academically isolated, rarely cited others, did not engage with scientific method or theory, nor did he train students (Bennett 1948: 337). Hence he cannot be considered the ‘father’ of Tiwanaku archaeology. Measured critiques of his interpretations were taken as personal attacks and vehemently refuted. Posnansky’s dogmatism led to a series of acrid polemics with politicians and researchers alike. These debates continually raised the profile of Tiwanaku and Posnansky on the national and world stage, independent of the quality of information. This type of public conflict would repeat itself over the years with figures such as Camas, Ibarra Grasso, Imbelloni, Sundt, and Uhle (Ponce Sanginés 1994: 108–129; Schávelzon 1996: 341–344). Posnansky’s basic narrative changed little over the decades. His first major archaeology book, published in 1914 in Berlin, was re-published in 1945 in New York, with minimal changes, as volume I of his opus (Bennett 1948: 336). The books have the same double-column bilingual format (German–Spanish in 1914 and English–Spanish in 1945).4 He often included a list of his publications at the end of his articles; the latest and perhaps most complete bibliography is in volume III of his opus (Posnansky 1957). However, his own citations include numerous errors (Schávelzon 1996: 353). He cited manuscripts that were never published and confused publications with similar titles in different languages. Generally, he wrote in Spanish and German; English publications were translated. By one account he learned seven languages and five dialects, though this seems like an exaggeration (Gracia 2014). Schávelzon’s (1996) well-researched compilation is the most useful bibliography, which includes 133 publications and indicates when the same text was published in different venues. A prior compilation lists 161 publications (Costa de la Torre 1974b), but has a number of errors. Ponce Sanginés (1994) cited 91. Posnansky also wrote numerous newspaper articles, letters, and other short communications. He went well beyond archaeology and was not timid in participating in social and political debates (Costa de la Torre 1974a: 21). The multifaceted Posnansky wrote on Einstein, folklore, sociology, politics, war, social reform, and was a ‘cultural driving force’ in La Paz, where he was known as ‘Don Arturo’ (Schávelzon 1996: 161). He was elected to the city council in 1905 after living in La Paz for just two years (Parker 1922: 232). A year later he brought the first automobile in Bolivia, a 35-horsepower Stuttgart-built Mercedes with a top speed of 120 kilometers (75 miles) per hour, though at the time there were no roads in La Paz on which a car could go that speed (Figure 13; Ponce Sanginés 1994: 20–23). In the last years of his life, in the United States, he designed and patented a machine harvesting quinoa, the currently fashionable Andean grain (Schávelzon 1996: 351). He also began an ambitious re-edition of Bertonio’s 1612 Aymara vocabulary (van den Berg 2012: 27–28). 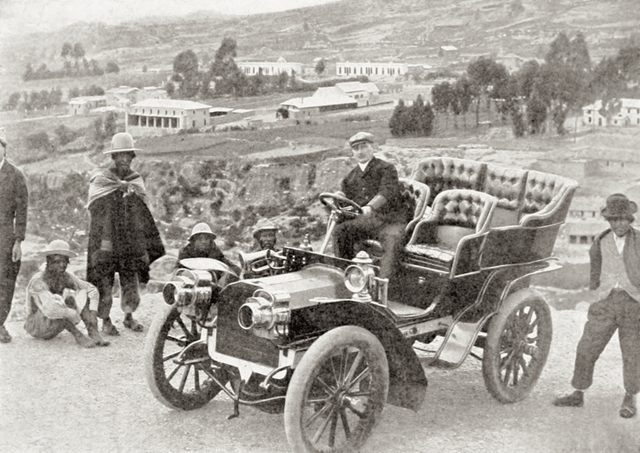 Posnansky in his new car on the outskirts of La Paz, perhaps taken while traveling with Robinson Wright (1907: 215). He was directly involved in the excavation, filming, and photographing of the Bennett monolith as well as the public debate about its transport to La Paz (Loza 2008). The monolith was recovered during Bennett’s (1934) excavations, but Posnansky basked in his own romanticized descriptions of how he ‘dragged himself in the sludge to lie underneath the monolith and, candle in hand, finished removing the mud off the back of the sculpture with his fingernails’ (Scarborough 2008: 1095). He led efforts to protect the famous monolith, Tiwanaku’s largest stone stelae (7.3 m in height), which was returned to Tiwanaku in 2002 (Sammells 2012: 308). He proposed a national park around Tiwanaku (Ponce Sanginés 1994: 60–65; Posnansky 1937b), a detailed plan that aimed to reconstruct parts of the past and foster tourism. He suggested moving entire towns to the park where they could preserve and demonstrate their traditional ways of life in shows and dances. While perhaps not out of place for the time, today this has the sardonic ring of a human zoo. He proposed surrounding the park with a barbed-wire fence and patrols, a detail that conjures images of a concentration camp, at least for Ponce Sanginés (1994: 62). However, the spirit of the farsighted proposal was to preserve the archaeological site following the model of US national parks (Posnansky 1937b). In 1945, Tiwanaku was declared a national monument (Ponce Sanginés 1994: 61), and currently, a guarded chain-link fence surrounds the core of the archaeological site. He proposed other natural reserves and was concerned with the disappearance of the vicuña, in addition to more grandiose plans for a national railway and a hydroelectric dam. As an engineer and historian, he was member and president of countless organizations and institutions, notably the storied Geographic Society of Bolivia (Browman 2007; Costa Ardúz 2005). He started journals, won prizes in Bolivia and abroad, and was the director of the National Museum and Institute of Criminology. He continually made long journeys to conferences in South America, North America, and Europe, usually as the head of the Bolivian delegation (Costa de la Torre 1974a: 20). He founded the Archaeological Society of Bolivia in 1930, four years before the United States’ Society for American Archaeology was created (Ponce Sanginés 1994: 98–105). This society played a significant role in the history of archaeology in Bolivia (Browman 2007). He was an avid photographer and even started a film company while this industry was in its infancy (Ponce Sanginés 1994: 53–56). His most notable film was the 1926 The Glory of the Race, now lost (Richards 2005: 199–202), which was an idealized reconstruction of the destruction of Tiwanaku that recalls Posnansky’s active imagination of the site and its inhabitants. Dancing along the fuzzy line between fact and fiction, it was a vivid presentation of the passionate visions of an amateur archaeologist. His imagination seems to have been fueled by his years of ethnographic work that saw modern groups as unchanged for millennia (e.g. Posnansky 1934). The same blurry line is echoed in the publications of Edmund Kiss, with whom Posnansky worked closely (Gildner 2013: 107–108). Kiss was a Nazi architect and novelist taken by Posnansky’s myth of Tiwanaku, World Ice Theory, Atlantis, and Aryan migrations (Goodrick-Clarke 2002: 131–134).5 Kiss (1937: Figures 34–36) drafted fanciful reconstructions of Tiwanaku architecture populated by Aryans. His novels closely followed racially-informed pseudo-archaeology (Pringle 2006; Gildner 2013) that was re-told and popularized by Heyerdahl (1958; see Andersson 2010: 85–87), Von Däniken (1969), and Hancock (1995). These authors, like Posnansky, were seriously wrong about the facts, but all shared an imaginative spark that had a lasting influence. I suspect that many archaeologists share this spark in thinking about the past. When I first started doing archaeological research in Bolivia, I was unaware of the lasting influence of pioneers like Posnansky. During my dissertation fieldwork (2005–2009), this became increasingly clear. 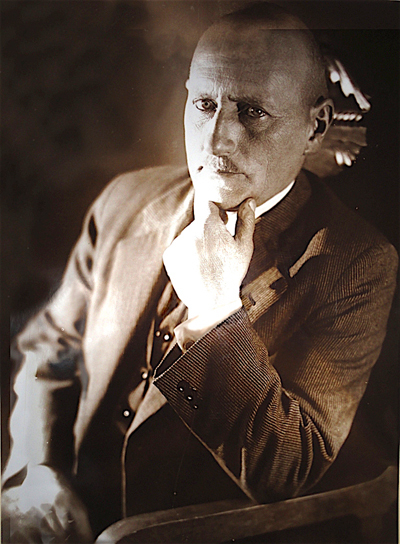 Posnansky was instrumental in organizing research and acquiring permits for Bennett (1934), from the US, who published the site’s first systematic excavation and chronology. This may be why Bennett was not publicly critical of Posnansky’s theories or methods, at least while he was alive. 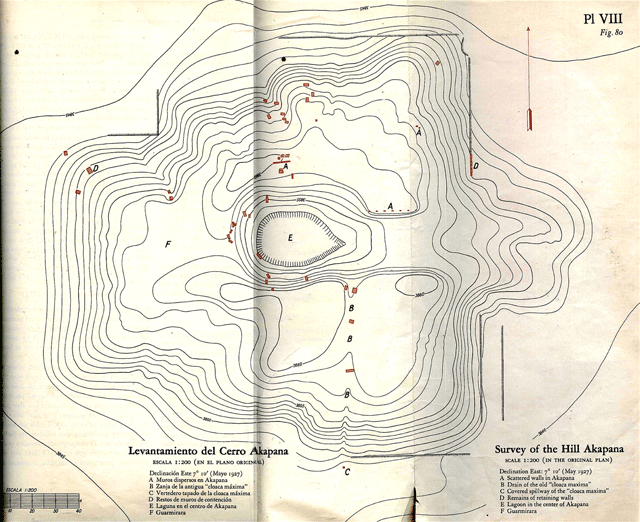 Posnansky did the same favor for the Argentine Casanova (1937, 1942), who directed one of the site’s most extensive excavations; it was never published in detail (Kolata and Ponce Sanginés 2003: 24–25). These expeditions relied directly on Posnansky’s helpful attitude and political connections. Understanding the dominant personalities and their politics can cast light on why some theories were widely disseminated and others were not. Posnansky did not train students but he did unknowingly found an intellectual family tree. After Posnansky’s death, Ponce Sanginés became the driving force in Bolivian archaeology and owed him an unrecognized intellectual debt (Stanish 2002: 175). Ponce Sanginés (1969) was suspicious of foreign researchers and kept them out of Bolivia for decades (Albarracín-Jordan 2007: 33–38) until his landmark blessing of Tiwanaku’s largest project, led by Alan Kolata (2003) and Oswaldo Rivera in the 1980s and 1990s. Kolata’s most prolific student was John Janusek (2004), who directed an extensive excavation at a nearby site in the 2000s. I joined Janusek’s project and its cohort of graduate students in 2005 and became linked to this sequence of scholars and ideas. Then and now, archaeologists’ personal lives and politics are tightly tied to their research and conclusions. They still hold a central place in the modern matrix of scientific and popular ideas surrounding Tiwanaku, much of which traces directly back to Posnansky. The historical character of Posnansky belongs to a prominent coterie that has inspired the Hollywood-constructed mystique of the adventurer-archaeologist, embodied and popularized in Indiana Jones. I confess that my initial attraction to archaeology owed in no small part to this mystique. The 1980s Indiana Jones character was based on Harry Steele (played by Charlton Heston) from the 1954 film Secret of the Incas, released shortly after Posnansky’s death.6 These movie characters were inspired by real pioneers and their charming penchant for the dazzling at the expense of the systematic (e.g. Heany 2010).7 Larger-than-life personalities seem to have been prerequisites for forays into unmapped regions, pushed onward by an audacious drive to seek out the exotic and revel in the prestige of reporting these discoveries in the US and Europe. These historical and fictional figures continue to impact undergraduate students, aspiring archaeologists, and the public’s perception of the field and its findings. Posnansky’s polarizing legacy continues to be relevant. Because he was not a trained researcher, his ideas and activism were even more intertwined with his passions and changing times. His theories are obsolete but he cannot be faulted for the fervor with which he brought Tiwanaku to the world (Schávelzon 1996: 336). His wife Alicia said he was ‘in love with the ruins of Tiwanaku, in which he found his raison d’être’ and that his orderly routine involved waking up everyday at 4 a.m. to write (Ponce Sanginés 1994: 93). His contemporaries were roundly critical of his conclusions (see Sammells 2012: 308) but respected the zeal of ‘Bolivia’s leading archaeologist’ (Steward 1946), a ‘man of action’ devoted to defending Tiwanaku (Bennett 1948: 337). His legacy and his publications still have a central place in the history of archaeology in Bolivia and archaeology at Tiwanaku. His ethnography of the Uru (Posnansky 1934) remains relevant to modern research (Saenz 2006). His photographs (including early aerial photographs), drawings, and maps are universally lauded as elegant, elaborate, and accurate (e.g. Figure 14; see Bennett 1934: 368, 1948; Janusek 2004: 62–63; Steward 1946). These are the primary source for documenting the state of Tiwanaku in the early 1900s, in addition to Uhle’s photographs (Vranich 2010), prior to Ponce Sanginés’ ambitious and questionable reconstructions that tourists visit today (Browman 2005: 19; Protzen and Nair 2000). Modern tourist guides still mention Posnansky’s discredited idea that the monuments and engravings recorded calendars or astronomical observations (Sammells 2012: 302). His efforts secured Tiwanaku’s place in the world spotlight, a preliminary step to the site being declared a UNESCO World Heritage Site in 2000. This recognition and accompanying financial support would partly fulfill Posnansky’s life-long goal of protecting the site. Plan drawing of the Akapana hill in 1927, one of Tiwanaku’s principal monuments (Posnansky 1945, II: Map VIII, Fig. 80). Posnansky’s prolific publications touched on modern research topics at Tiwanaku. For example, he worked on reconstructions of changes in the level of Lake Titicaca (Posnansky 1945, I: Chapter 3). He was concerned with reconstructing the ancient climate and saw a close relationship between cultural collapse and climatic catastrophe. This topic and even his conclusion is echoed by recent publications, though modern data are much better. The possibility of widespread drought leading to Tiwanaku’s collapse has been a point of debate (see Binford et al. 1997; Calaway 2005; Erickson 1999; Kolata et al. 2000; Ortloff and Kolata 1993). Archaeologists recognize his contributions, not least of all for stoking the curiosity and imagination that can inspire systematic research (Sammells 2012: 308–309). Posnansky is comparable to other archaeological pioneers, though by some measures he has had a more sustained and enduring impact. As the undisputed czar of Tiwanaku, he was singularly important for the first half of the twentieth century. His interpretations were considered authoritative and he remained well-respected long after his death. His opus remained the central publication on Bolivian archaeology for decades after his death, including at Harvard in the 1960s (D. Browman, personal communication 2018). ‘Posnansky week’ was held in La Paz in 1973 on the one-hundredth anniversary of his birth (Costa de la Torre 1974a) and his opus was re-published by the Municipality of La Paz in 2012, a clear sign of sustained interest and respect (Soruco 2012). Posnansky’s remains are at the Mausoleum for the Heroes of the Acre in the General Cemetery of La Paz, but ‘his soul surely rests at Tiwanaku’ (Gracia 2014). 1All quotations are my translations from the Spanish. For the sake of readability, I use English glosses for foreign-language institutions and publications. The original names are in the bibliography. 2I use the modern spelling ‘Tiwanaku’, though there are various alternate spellings, for example, in the title of Posnansky’s opus. The original versions are in the bibliography. 3Like Posnansky, Uhle was so fascinated by Tiwanaku that he wrote about the site before ever visiting (Stübel and Uhle 1892). He traveled to the site in 1894 but failed to secure a permit to excavate (Ponce Sanginés 1994: 114; Vranich 2010: 63). Later, Uhle (1912) attacked Posnansky’s chronology and for not citing his own research. 4Ponce Sanginés (1994: 90) explains how this well-known publication, volumes I and II, became such a bibliographic rarity. Posnansky paid the company J.J. Augustin to print the book and had only about one hundred copies sent to Bolivia. Posnansky died the next year and eventually the company got rid of the unclaimed copies. Volumes III and IV (a total of 275 pages) were published posthumously in 1957 by the Ministry of Education in Bolivia, which comprise high-quality color plates and photographs and a bibliography (Ponce Sanginés 1994: 97). Ponce Sanginés (1994: 90) noted that Carmelo Corzón was enthusiastically working to re-publish Posnansky’s opus with the La Paz publishing house Cima (run by Ponce Sanginés). After nearly seventy years, it was finally re-published in 2012 by the Municipality of La Paz (Soruco 2012). 5Kiss successfully promoted these ideas within the Nazi government (Goodrick-Clarke 2002: 133) and secured funding for a very large research project to South America, including Tiwanaku, but the expedition was cancelled with the German invasion of Poland that started World War II (Pringle 2006: 178–183). 6The film can be seen online (http://www.youtube.com/watch?v=20TAGRElvfE). The costumes of Harry Steel and Indiana Jones are very similar, not to mention the story and a few specific sequences. According to Wikipedia, this was the first time a major Hollywood studio filmed at Machu Picchu and the film caused a surge of tourism to Peru in 1954 (http://en.wikipedia.org/wiki/Secret_of_the_Incas). 7Thanks to my first archaeology professor, Douglas Bamforth, for bringing this sparkling facade down to earth by assigning a critique of Indiana Jones’ methods. I am grateful to David Browman and Matthew Gildner for stimulating discussions, research notes, and scanned documents. David Browman suggested the title. Daniel Schávelzon provided useful comments. Kevin Lane provided bibliographic details. Out-of-copyright publications have recently become more available online, thanks to efforts by individuals and organizations such as Google, the non-profit Internet Archive, and others, as indicated in the bibliography (all links were working as of 25 February 2019). I am grateful for the continuing support of CONICET (Argentina). Any errors or omissions are my own. Adams, A. 1915. The Plateau Peoples of South America: An Essay in Ethnic Psychology. London: George Routledge & Sons. http://archive.org/details/cu31924019964489. Albarracín-Jordan, J. 2007. La formación del estado prehispánico en los Andes: Origen y desarrollo de la sociedad segmentaria indígena. La Paz, Bolivia: Fundación Bartolomé de las Casas. Allen, J. 1998. Atlantis: The Andes Solution. The Discovery of South America as the Legendary Continent of Atlantis. Gloucestershire, UK: Windrush. Ameghino, F. 1880. Antigüedad del Hombre en el Plata. Volume I. Paris: G. Masson and Buenos Aires: Igon Hermanos. (of a 1918 edition). http://archive.org/details/laantigedaddel01ameg. Angrand, L. 1866. Lettre sur les antiquités de Tiaguanaco et de l’origine présumable de la plus ancienne civilisation du Haute Pérou. Paris: La Claye. Báyron, GM. 1974. Recompensas que recibió el capitán Arturo Posnansky por sus servicios en la campaña del Arce y por la venta de su lancha ‘Iris’, armada en guerra. In: Homenaje al profesor Arturo Posnansky en el centenario de su nacimiento, 9–14. La Paz: Renovación. Bellamy, H. 1936. Moons, Myths, and Man: A Reinterpretation. London: Harper and Brothers. Bellamy, H and Allan, P. 1956. The Calendar of Tiahuanaco: A Disquisition on the Time Measuring system of the Oldest Civilization in the World. London: Faber and Faber. Bennett, W. 1934. Excavations at Tiahuanaco. Anthropological Papers of the American Museum of Natural History, 34: 359–494. http://hdl.handle.net/2246/79. Bowen, R. 1993. Universal Ice: Science and Ideology in the Nazi State. London: Belhaven. Bowman, W. 1999. Priest and Parish in Vienna: 1780 to 1880. Boston: Brill. Browman, D. 2007. La Sociedad Arqueológica de Bolivia y su influencia en el desarrollo de la práctica arqueológica en Bolivia. Nuevos Aportes, 4: 29–54. Cahnman, W. 1989. German Jewry: Its History and Sociology. Selected essays by Werner J. Cahnman. Brunswick, N.J.: Transaction. Castillo, T. 1918. América monumental: El palacio Posnanski de La Paz. Variedades (Lima), 561: 1137–1140. https://icaadocs.mfah.org/icaadocs/ELARCHIVO/RegistroCompleto/tabid/99/doc/1125752. Comas, J. 1945. La discriminación racial en América. América Indígena, 5: 73–80, 161–170. Costa Ardúz, R. 2005. Historia de la Sociedad Geográfica de La Paz. La Paz: Atenea. Costa de la Torre, A. 1974a. En el centenario del nacimiento del profesor Arturo Posnansky. In: Homenaje al profesor Arturo Posnansky en el centenario de su nacimiento, 15–22. La Paz: Renovación. Costa de la Torre, A. 1974b. Bibliografía general del profesor Arturo Posnansky. In: Homenaje al profesor Arturo Posnansky en el centenario de su nacimiento, 23–32. La Paz: Renovación. Créqui-Montfort, G. 1906. Fouilles de la Mission Scientifique Français à Tiahuanaco. Ses recherches archéologiques et ethnographiques en Bolivie, au Chile, et dans la République Argentine. In: Internationaler Amerikanisten-Kongress, Vierzehnte Tagung, Stuttgart 1904, 531–550. Stuttgart: Kohlhammer. https://archive.org/stream/internationaler00plaggoog#page/n714. Diaz Romero, B. 1906. Tiahuanacu: Estudio de prehistoria americana. La Paz: Artística. https://archive.org/details/tiahuanacuestud00romegoog. Fagan, G. 2006. Archaeological Fantasies: How Pseudoarchaeology Misrepresents the Past and Misleads the Public. London: Routledge. Fifer, J. 1970. The Empire Builders: A History of the Bolivian Rubber Boom and the Rise of the House of Suarez. Journal of Latin American Studies, 2: 113–146. https://www.jstor.org/stable/156583. Gildner, M. 2013. Andean Atlantis: Race, Science and the Nazi Occult in Bolivia. The Appendix, 1: 104–109. https://theappendix.net/issues/2013/4/andean-atlantis-race-science-and-the-nazi-occult-in-bolivia. Goodrick-Clarke, N. 2002. Black Sun: Aryan Cults, Esoteric Nazism and the Politics of Identity. New York: New York University. Gracia, I. 2014. Posnansky: Tiwanaku en el alma. La Razón, 9 March. La Paz. https://www.la-razon.com/index.php?_url=/suplementos/escape/Posnansky-Tiwanaku-alma_0_2010998950.html. Hale, C. 2003. Himmler’s Crusade: The Nazi Expedition to Find the Origins of the Aryan Race. New Jersey: John Wiley and Sons. Hancock, G. 1995. Fingerprints of the Gods. London: William Heinman. Havenon, G. 2004. Recording Civilization. In: Erickson, R, Font, MA and Schwartz, B (eds. ), Conference proceedings of ‘Alexander von Humboldt: From the Americas to the Cosmos’, October 14–16, 325–342. New York: The Bildner Center for Western Hemisphere Studies. https://www.gc.cuny.edu/CUNY_GC/media/CUNY-Graduate-Center/PDF/Centers/Bildner%20Center%20for%20Western%20Hemisphere%20Studies/Publications/humboldt.pdf. Heany, C. 2010. Cradle of Gold: The Story of Hiram Bingham, a Real-Life Indiana Jones, and the Search for Machu Picchu. New York: Palgrave Macmillan. Heyerdahl, T. 1958. Aku-Aku: The secret of Easter island. Chicago: Rand McNally. https://archive.org/details/akuakusecretofe00heye. Hrdlička, A. 1912. Early Man in South America. Washington, DC: Government Printing Office. https://archive.org/stream/earlymaninsoutha00hrdl. Inwards, R. 1884. The Temple of the Andes. London: Vincent Books, Day & Son. https://archive.org/details/templeandes00inwagoog. Kiss, E. 1937. Das Sonnentor von Tihuanaku und Hörbigers Welteislehre. Leipzig: Köhler & Amelang. https://archive.org/details/Kiss-Edmund-Das-Sonnentor-von-Tihuanako. Kolata, A. 1993. The Tiwanaku: Portrait of an Andean Civilization. Cambridge, MA: Blackwell. Kolata, A. 2003. The Proyecto Wila-Jawira Research Program. In: Kolata, A (ed. ), Tiwanaku and Its Hinterland: Archaeological and Paleoecological Investigations of an Andean Civilization, Vol. 2: Urban and Rural Archaeology, 3–17. Washington, D.C.: Smithsonian Institution Press. Kolata, A and Ponce Sanginés, C. 2003. Two Hundred Years of Archaeological Research at Tiwanaku: A Selective History. In: Kolata, A (ed. ), Tiwanaku and Its Hinterland: Archaeological and Paleoecological Investigations of an Andean Civilization, Vol. 2: Urban and Rural Archaeology, 18–29. Washington, D.C.: Smithsonian Institution Press. Maldonado Leoni, J. 2009. El capitán Arthur Posnansky en la guerra del Acre. Revista de la Fundación Cultural del Banco Central de Bolivia, 60: 39–50. https://eeadv.wordpress.com/ejercito-de-bolivia/historia-militar-de-bolivia/guerra-del-acre/. Marsh, E. 2005. Politically Mobilizing Collections of Material Culture: Three Nineteenth-Century French Expeditions to Tiwanaku, Bolivia. Paper presented at the 40th Annual UCLA Art History Graduate Student Symposium. Los Angeles. Mitre, B. 1879. Las ruinas de Tiahuanaco. Buenos Aires: Pablo Coni. www.biblioteca.org.ar/libros/656484.pdf. Morris, A. 2004. Raised Field Technology: The Raised Fields Projects Around Lake Titicaca. Burlington, VT: Ashgate. Müller, R. 1931. Der Sonnentempel in den Ruinen von Tihuanacu. Versuch einer astronomischen Altersbestimmung. Baessler–Archiv, 14: 123–142. https://www.mysteria3000.de/magazin/der-sonnentempel-in-den-ruinen-von-tihuanacu/. Oyuela-Caycedo, A. 1994. Nationalism and Archaeology: A Theoretical Perspective. In: Oyuela-Caycedo, A (ed. ), History of Latin American Archaeology, 3–21. Aldershot, UK: Avebury. Parker, W. 1922. Bolivians of To-day. 2nd ed. London: Hispanic Society of America. https://archive.org/details/boliviansoftoday00parkuoft. Ponce Sanginés, C. 1969. El colonialismo científico y la desaparición del patrimonio arqueológico boliviano. El Diario. 2, 14, and 28 December. La Paz. Ponce Sanginés, C. 1978. El instituto nacional de arqueología de Bolivia: Su organización y proyecciones. Publication No. 26. La Paz, Bolivia: Instituto Nacional de Arqueología. Ponce Sanginés, C. 1994. Arthur Posnansky y su obsesión milenaria: Biografía intelectual de un pionero. La Paz, Bolivia: Producciones Cima. Posnansky, A. 1904. Campaña del Acre, la lancha ‘Iris’, aventuras y peregrinaciones. La Paz: El Diaro. Posnansky, A. 1912. Guía general ilustrada para la investigación de los monumentos prehistóricos de Tihuanacu é Islas del Sol y la Luna. La Paz: Imprenta y Litografía Boliviana. https://iiif.lib.harvard.edu/manifests/view/drs:49310010$1i. Posnansky, A. 1914. Eine praehistorische Metropole in Südamerika/Una metrópoli prehistórica en la América del Sud. Berlin: Dietrich Reimer. Posnansky, A. 1934. Los Urus o los Uchumi. In: Actas y Trabajos del XXV Congreso Internacional de Americanistas (La Plata, 1932), 235–300. Buenos Aires: Coni. Posnansky, A. 1937a. Antropología y Sociología de las Razas Interandinas y de las Regiones Adyacentes. La Paz, Bolivia: Instituto Tiwanaku de Antropología, Etnografía y Prehistoria, Editorial Renacimiento. Posnansky, A. 1937b. Un ‘Parque Nacional en Bolivia’. La Paz, Bolivia: Instituto Tiwanaku de Antropología, Etnografía y Prehistoria, Editorial Renacimiento. Posnansky, A. 1943. ¿Qué es raza? La Paz: Instituto Tihuanacu de Antropología, Etnografía y Prehistoria. Posnansky, A. 1945. Tihuanacu: The Cradle of American Man. Volumes I and II. Translated by James F. Shearer. New York: J.J. Augustin. Posnansky, A. 1957. Tihuanacu: The Cradle of American Man. Volumes III and IV. Translated by James F. Shearer. La Paz: Ministerio de Educación, Bolivia. Posnansky, M. 2009. Africa and Archaeology: Empowering an Expatriate Life. London: Radcliffe. Pringle, H. 2006. The Master Plan: Himmler’s Scholars and the Holocaust. London: Fourth Estate. Quisbert, CP. 2004. ‘La gloria de la raza’: Historia prehispánica, imaginarios e identidades entre 1930 y 1950. Revista de Estudios Bolivianos, 12: 177–212. https://repositorio.umsa.bo/bitstream/handle/123456789/12335/EB012.pdf. Rabinbach, A. 1975. The Migration of Galician Jews to Vienna, 1857–1880. Austrian History Yearbook, 11: 43–54. https://www-cambridge-org.libproxy.berkeley.edu/core/journals/austrian-history-yearbook/article/migration-of-galician-jews-to-vienna-18571880/4A59DD0F874C211DF265E1C0DD6EC7AB. Robinson Wright, M. 1907. Bolivia: The central highway of South America, a land of rich resources and varied interest. Philadelphia: George Barrie and Sons. https://archive.org/details/boliviacentralhi00wrig/page/n14. Rossells, B. 2004. Espejos y máscaras: El discurso indigenista en las artes plásticas (1900–1950). Estudios Bolivianos, 12: 297–400. https://repositorio.umsa.bo/bitstream/handle/123456789/12335/EB012.pdf. Saenz, V. 2006. Symbolic and Material Boundaries: An archaeological genealogy of the Urus of Lake Poopó, Bolivia. Unpublished PhD Dissertation, Department of Archaeology and Ancient History, Uppsala University, Sweden. https://www.diva-portal.org/smash/get/diva2:169043/FULLTEXT01.pdf. Schávelzon, D. 1991. Mitre en Tiahuanaco. Todo es Historia, 292: 52–65. https://www.danielschavelzon.com.ar/?p=855. Schávelzon, D. 1993. La arqueología como ciencia o como ficción. La polémica vida y obra de Arthur Posnansky en Tiahuanaco. Todo es Historia, 309: 32–49. https://www.danielschavelzon.com.ar/?p=1825. Schávelzon, D. 1996. Posnansky y la arqueología boliviana: Una bio-bibliografía. Beiträge zur Allgemeinen und Vergleichenden Archäologie, 16: 335–358. Soruco, J. 2012. Alcaldía presenta la reedición de Tihuanacu de Arturo Posnansky. La Razón Digital, 28 November. La Paz. https://www.la-razon.com/index.php?_url=/la_revista/Alcaldia-reedicion-Tihuanacu-Arturo-Posnansky_0_1732626824.html. Squier, E. 1877. Peru: Incidents of Travel and Exploration in the Land of the Incas. New York: Harper and Brothers. https://archive.org/details/peruincidentsoft00squi. Stanish, C and Bauer, B. 2004. History, Culture, and Geography of the Islands of the Sun and Moon. In: Stanish, C and Bauer, B (eds. ), Archaeological Research on the Islands of the Sun and Moon, Lake Titicaca, Bolivia: Final Results of the Proyecto Tiksi Kjarka. Los Angeles: Cotsen Institute of Archaeology, University of California. Stefanoni, P. 2012. Jano en los Andes: Buscando la cuna mítica de la nación. Arqueólogos y maestros en la Semana indianista boliviana de 1931. Ciencia y Cultura, 29: 51–81. www.redalyc.org/pdf/4258/425839842004.pdf. Stübel, A and Uhle, M. 1892. Die Ruinenstätte von Tiahuanaco im Hochlande des alten Peru. Leipzig: Hiersemann. https://digi.ub.uni-heidelberg.de/diglit/stuebel_uhle1892/0004. Uhle, M. 1912. Posnansky—Guía general ilustrada para la investigación de los monumentos prehistóricos de Tihuanacu é Islas del Soil y Luna, etc.—La Paz 1911 (Review). Revista Chilena de Historia y Geografía, 5: 467–479. http://www.memoriachilena.gob.cl/602/w3-article-121981.html. van den Berg, H. 2012. Las ediciones del Vocabvlario de la lengva aymara. Ciencia y Cultura, 28: 9–39. https://www.redalyc.org/pdf/4258/425839841002.pdf. Villamil de Rada, E. 1888. La lengua de Adán y el hombre de Tiaguanaco. La Paz: La Razón. www.andesacd.org/wp-content/uploads/2013/09/Lengua-de-Adan.pdf. Von Däniken, E. 1969. Chariots of the Gods? London: Souvenir Press. https://dl.lilibook.ir/2016/04/Erik-Von-Daniken-Chariots-of-the-Gods.pdf. Vranich, A. 2010. Revalorizando a Max Uhle en Tiwanaku. In: Kaulicke, P, Fischer, M, Masson, P and Wolff, G (eds. ), Max Uhle (1856–1944): Evaluaciones de sus investigaciones y obras, 63–78. Lima: Pontificia Universidad Católica del Perú. Williams, E. 1993. Collecting and Exhibiting Pre-Columbiana in France and England, 1870–1935. In: Boone, E (ed. ), Collecting the Pre-Columbian Past, 123–140. Washington, D.C.: Dumbarton Oaks.